That changed yesterday when I stumbled across Nicolas P. Rougier's beautifully designed and comprehensive -- but plainly-titled, Matplotlib tutorial, which includes easy-to-follow and interesting geovisualization examples, among many other elegant demonstrations. That was enough to get me to try matplotlib again. Another big problem for me has been the lack of well-documented best practices for GIS work for Python 3.x (there are plenty of 2.x examples). However, I recently found this mapping tutorial from the Intro to Python guide. The best part of it for me was the installation instructions, which alluded to the possibility that the Anaconda Python 3.x framework includes a recipe for Basemap, a plugin for matplotlib for plotting data on map projections. 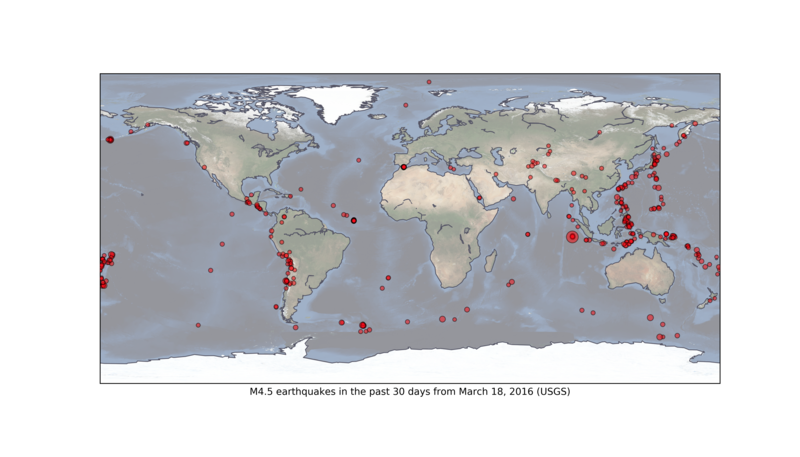 His example shows how to animate the earthquakes, similar to an animated torque map at CartoDB. I've opted to show less matplotlib-specific code, including pretending that numpy and pandas don't exist (I want to teach matplotlib initially by showing that lists of values can serve as the plotting arguments, and that numpy/pandas just expedite the process). Note: I'm deliberately not using matplotlib's OOP style in favor of the global plt object, just to show the relative bare minimum of code to produce a visualization in matplotlib...however, I am avoiding the use of pylab, which seems to be a legacy practice on the verge of being deprecated. what projection did you use ? how did you get the coordinates to match?